Last week I left Fairbanks with “Solar” Joe Yarkin for a three-week sojourn in Alaska to work on various alternative / renewable energy projects funded by The National Science Foundation (NSF). Joe and I drove up to Toolik Field Station, bumping along the Dalton Highway under blue skies. Early Boy Scout training reinforced by a couple of decades of field experience has taught me the value of the motto, “always be prepared.” So we left Fairbanks with a truck bed full of carefully ordered and packed supplies, assembled to meet any MacGyver challenge Alaska can throw at us. Winter had not been kind to the paved sections of this legendary road, resulting in serious frost heaves in places. Some sections are really great, others not so much. On such a long drive, it’s easy to let the good sections lull you into complacency and let the speeds start creeping upwards. Then you hit a big frost heave and all of the carefully packed supplies in the back are launched into the ceiling. Slow and steady wins the race. After a scenic and kidney-jarring nine-hour drive, we arrived at the field station, our supplies now helter-skelter and covered with road dust, but otherwise unscathed. Running principally east to west, the Brooks Range is one of the great dividing mountain ranges of the world; trees on one side, tundra on the other. The contrast is truly amazing. Once over Atigun Pass (made famous in the popular anti-reality show “Ice Road Truckers”), we found we had left spring behind on the south side of the pass. The northern terrain was still impressively snow-covered. We established our home base for the next two weeks at Toolik Field Station. In the a.m., we headed for Imnavait Creek, about 10 miles up the road from the station. 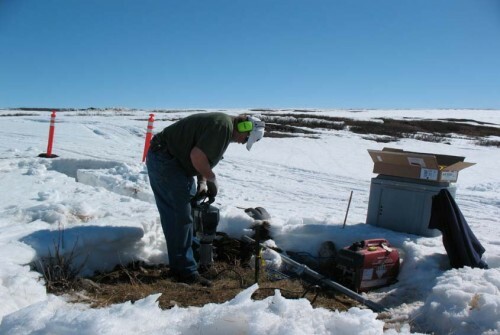 On the tasking list: check the condition of power/communications systems we installed and maintain for National Science Foundation-funded research such as Steve Oberbauer’s International Tundra Experiment (ITEX) project. In addition to maintenance, Joe and I also are erecting two experimental micro-wind generators. These little 50Watt machines are tentatively rated to operate at -70C, far lower than any other wind turbine available. This test is to see if what is written on paper can survive the real world rigors of a North Slope winter. We will route the power to one of Oberbauer’s ITEX systems, as well as to the SRI-developed “Communications Node” which is a hybrid power and communications system using a methanol fuel cell, augmented by solar and now wind power to stretch the small fuel supply. If these tiny wind turbines perform even close to as advertised, they could prove to be a useful component for research projects with modest power requirements that need to collect data through harsh polar winters. We also will install a new, scientific-grade, polar-rated anemometer (wind-measuring instrument) on a 45’ tower at Toolik Field Station. We want to determine if the wind resource is sufficient to warrant integrating wind power into the station electrical grid; however, the data collected will be archived and publicly accessible, and should be a valuable resource to the research community as well. The unseasonably deep snow cover—up to three feet in places—was a boon and a bane. While it made finding the anchor locations for the anemometer tower meticulously marked out last summer difficult, we were suitably equipped to handle it (see picture). 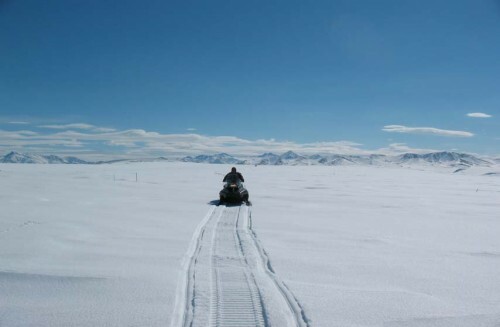 The snow cover also allowed us to use snowmobiles to access the sites for all of the autonomous power systems, rather than having to snowshoe the miles between them. This approach enabled us to bring in all of the required tools and replacement components in one fell swoop. Nice timesaver, that. 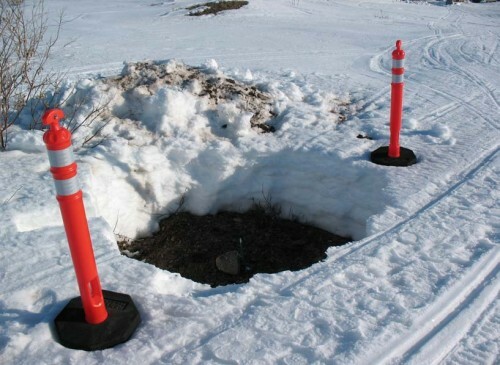 Back at Toolik on the anemometer project, cold ground temperatures and the heavy snow cover made concrete work challenging, but again, we had come prepared. We used an electric jackhammer to chip out the frozen ground for the anchor holes. Fortifying the concrete mix with extra Portland cement results in a very strong mix, but also leads to a very hot reaction and a fast cure time – almost too fast if you aren’t ready to set the steel straight away. This was some heavy work, and by afternoon the sun had softened the snow to the point where carrying an 80-pound jackhammer from one spot to another became an exercise in post-holing frustration. Still, by day’s end we had checked off each item on our tasking list. When we finish at Toolik this week, Joe will head home to tend his small farming operation on Vashon Island, Washington, and I will move on to Barrow and the small village of Atqasuk, where I will install the second two of four power and communications systems for the ITEX project. So far so good—but it’s not mosquito season yet. Note: For more on alternative and renewable energy uses in the polar regions, visit www.polarpower.org.